ALBUQUERQUE, New Mexico — With two weeks to go before New Mexico was set to administer its new standardized tests, Angel Mendez’s seventh-grade math classes at Truman Middle School here were taking an official practice exam online. The new tests from the Partnership for Assessment of Readiness for College and Careers (or PARCC, for short) are the first to be associated with the new higher standards of the Common Core and, unlike the past state exams, are being given on computer and with a time limit. Despite concerns the technology would trip them up, the students appeared to navigate the computer-based test with ease – marking questions they wanted to come back to later, for example. It was the math that seemed to give them trouble. Their enthusiastic first-year teacher had used the Common Core standards to guide what he’d taught the students all year, but the content of the sample exam, which required dragging and dropping algebraic expressions into boxes and filling in blank boxes with equations, was proving challenging. “I was looking through some of the things that they’re asking the kids to do, I was like, wow, this is intense,” said Mendez, 25, who had to make do without textbooks this year because Albuquerque School District’s new Common Core math books won’t be available till next year. Instead, he used websites such as Math-Aids.com to generate problem sets. Ranked near the very bottom of most lists of school performance and near the very top of most rankings of child poverty, New Mexico has gone further than most states in its embrace of high-profile education reforms. The state has linked the new Common Core standards with new exams and ramped up the stakes for teachers and schools, making it an extreme test case for a set of ideas promoted by education reformers, including the Obama administration. State officials are banking that their aggressive approach will turn around the state’s dismal education record, but, as the third- through eleventh-graders there began testing last month, the immense challenges the state will face in meeting its goals are already apparent. In New Mexico, 66 percent of public school students qualify for free or reduced-price lunch – meaning only Mississippi serves a higher percentage of poor students in its public schools. In all, 60 percent of the students in the state are Latino, and many come from families who recently immigrated to the United States. Unlike Mississippi or Washington, D.C., which also round out lists of lowest performing states, New Mexico has a sizable population (16 percent of its students) that is still struggling with learning English; it is one of eight states in the country where more than 10 percent of students are officially English Language Learners. The state also has a large proportion of students living on Native American reservations, many who live in poverty and face their own set of challenges; behind Alaska and Oklahoma, the state has the largest percentage of Native Americans (just over 10 percent). With Mississippi, New Mexico often ranks at the bottom, or close to it, on the National Assessment of Educational Progress, also known as the Nation’s Report Card. Just 21 percent of the state’s fourth-graders were proficient in reading in 2013 on the test, as opposed to 47 percent in high-performing Massachusetts. At the school, the preparations for the exam have been varied. Plenty of teachers are trying to shift gears to meet the new expectations, making sure their lessons match the Common Core and holding regular practice sessions for the tests using sample questions online. But some teachers have rejected the standards and ignored the tests because they doubt that the tests and the stakes attached to them will improve education. The school’s longtime principal, Judith K. Martin-Tafoya, has pushed the school to prepare for the exam and warned teachers that they will face significant consequences if they don’t, but doesn’t expect scores to go up quickly. There are other pressures on the school as well. Martin-Tafoya expected to have to cut seven teachers by the fall to address budget shortfalls in the district, she said. For other teachers the shift to Common Core has had little impact on how they run their classrooms. Sixth-grade English teacher Theresa Duran, a veteran in her 17th year, said she hasn’t changed her instruction or prepared her students for the PARCC exam, other than doing what she always has – teaching them to write. “Sometimes I think we have to prepare them for PARCC to a point, but I have to prepare them for life,” she said. She’s also all for accountability, she says, describing her impatience over how long it took her school to fire an incompetent teacher on her team – a few years by her count. Martinez’s education secretary, Hanna Skandera, has been a key player in New Mexico’s aggressive reform efforts. She was deputy commissioner under former Florida governor, Jeb Bush, and is a member of Chiefs for Change, a group of reform-minded state education leaders. In New Mexico, she’s working to keep up the pressure on schools to improve, including deciding that the state would not suspend its accountability measures even as the state adopted new tests. Related: How compatible are Common Core and technology? While other states have backed out of giving the new Common Core exam developed by PARCC – of the original 26 states that signed up for PARCC, just 11 plus Washington, D.C. will give it this year – New Mexico has stuck with the tougher tests. And even though the federal government offered states the chance to suspend the test-based ratings for schools and teachers for a year while making the switch over to the Common Core tests, New Mexico, like few others, has plunged ahead. New Mexico is one of just 18 states where the student scores from various tests count for half of teacher ratings or prevent a teacher from being rated effective if student test scores don’t hold up. The decision not to suspend the ratings puts her at odds with some other reformers. And not everyone agrees that high-stakes should ever be coupled with the new standards. Phil Daro, one of the writers of the Common Core math standards, has said that even the improved tests associated with the Common Core could force teachers to put aside what would be best in the classroom. But Skandera defended the choice to push ahead. “Each year is precious in how they are prepared from one year to the next, but I also think it’s important to be thoughtful, and make sure that we have an equitable system that takes into account that we are raising the bar, so we’re going to do this over a three-year period,” Skandera told the Hechinger Report. The teacher evaluations, up to 35 percent of which are based on the yearly exam with another 15 percent based on tests selected by the district, have been in place for two years already. The state exam portion is based on three years of scores. Next year’s evaluations will compare the old tests to the new, meaning there’s likely to be greater inaccuracy in the ratings, because the mathematical formula used to calculate the ratings could be comparing apples to oranges. Related: Should value-added teacher ratings be adjusted for poverty? But the pressure is working, Skandera argued. Last year, New Mexico showed the fastest rate of improvement of any state in its high school graduation rate, and a higher percentage of Latino students took and passed AP exams than in any other state. “We are starting to turn the tide,” she said. Her education policies have proved controversial locally, too, though. 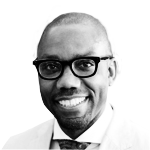 Skandera won the votes necessary for official confirmation only after four years serving as the nominee, just two weeks before the exams started. 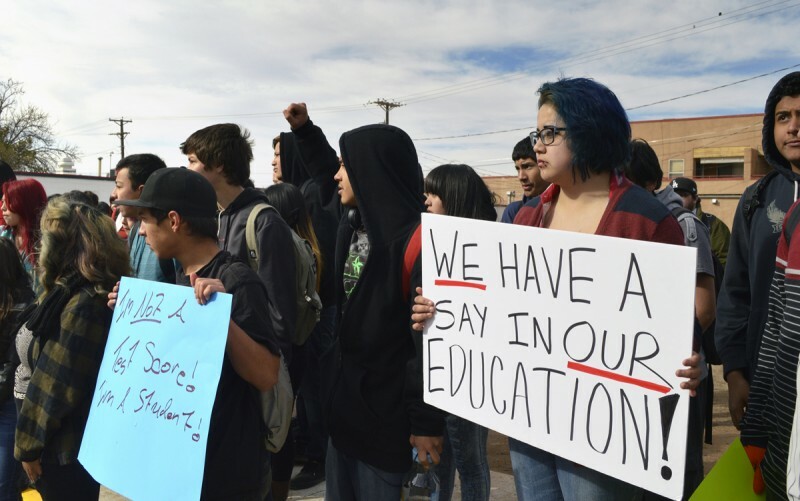 When testing began on the first Monday in March hundreds of students in Albuquerque, the largest school district in the state, walked out of their schools to protest the tests and the policies surrounding them. Later in the month, another group of protesters in Santa Fe marched from the state capitol to Skandera’s house. Opting out of the exam has also become widespread: Of Albuquerque’s 142 schools, 30 percent now face penalties from the state after at least 5 percent of students opted out of exams. It’s still an open question whether the pressure put on teachers is alienating them or helping focus them on improving instruction. At Truman, teachers brought up Governor Susana Martinez and Skandera by name when criticizing the new system. Over lunch, teachers discussed career alternatives if they lost their jobs – one had decided to become a medical translator, another talked about opening a bike shop. Another hurdle facing New Mexico is the computer skills required by the exam. New Mexico comes nearly last in online access from home, according to a census study. At Truman, teachers have scrambled to get students ready, however. Mendez and the math department have used the online math program Khan Academy, with many classes logging on at least once a week, so students will be used to doing math problems on the computer. The school also invested in new iPads to use in administering exams, but then the school district required that the exams be taken on computers or laptops, meaning the preparation and money spent on the iPads was partly wasted. Statewide, Skandera said, there’s been an investment of more than $10 million in computers and other technology with another $28 million in federal funds for upgrading the Internet connections at schools – and she noted that technology purchases could help with regular instruction, not just testing. Every Friday since December, eighth-grade English teacher Kate Siders, a 5th year teacher, has used her day with the school’s limited supply of computers to do sample questions for the PARCC exam, instead of assigning students research papers. “They ask the questions in such a different way than the state tests used to,” she said, adding that in years past, her test prep was mostly limited to reviewing key words a few weeks before the exams. The new tests were an impetus for change in her classroom – and not necessarily all for the better, she says. Although she still makes sure the students read four novels each year in class, she’s dropped creative writing in favor of essays. “It’s become far more introduction, conclusion, three pieces of evidence – the formula of a good piece of writing – than the thoughtfulness behind it,” she said. She’s dropped teaching grammar, because that’s not on the exam. She introduces the students to the standards themselves because that’s how the test questions are phrased. “The consequence is so great for me personally, I feel like I used to have days where we could react to current events and talk about it without, ‘I have to tie this back to standards,’” she said. There’s not time for that now, she added. “We have to keep on track.” Even as she works to get her students as prepared as possible, though, she’s dubious the new demands the state has placed on her and her students will lead to success. Plus, she’s worried about what’ll happen if a large number of them do badly on the tests.